Discontinued by Lifetime, Please see 60233. Discontinued by Lifetime in 2019. Please try the brown version 60233. 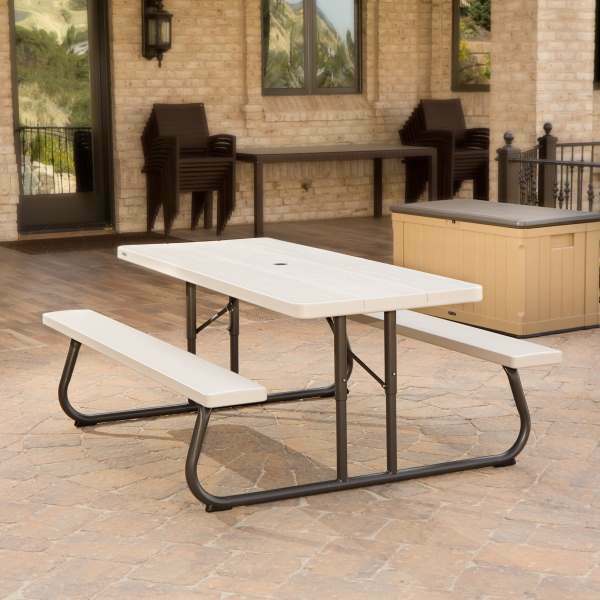 The Lifetime 6-Foot Picnic Table gives you that perfect extra outdoor eating space you've always wanted. 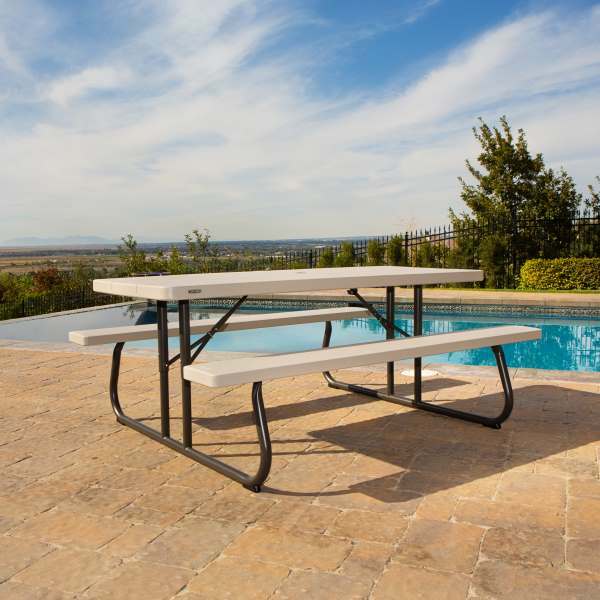 Constructed of UV-protected high-density polyethylene and powder-coated steel, our picnic tables are weather and rust resistant, and will not fade, crack, chip or peel. Stronger and more durable than wood, they are low-maintenance, stain resistant and easy to clean. 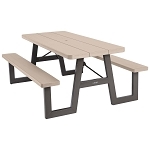 Best of all, Lifetime picnic tables fold completely flat for convenient storage. Includes Umbrella Hole and Cap. Steel Frame with All-Weather Finish. Will Not Crack, Chip, Rust, or Peel. Umbrella Hole Diameter: 1.7 in. (44,5 mm). Bench Weight Capacity: 900 lb. (408,2 kg). Dimensions (Folded): 72 in. L x 57 in. W x 3.8 in. H (182,9 cm L x 144,8 cm W x 9,8 cm H). Dimensions (Open): 72 in. L x 30 in. W x 29 in. H (182,9 cm L x 76,2 cm W x 73,7 cm H). Leg Tubing Diameter: 1.6 in. (42 mm). Materials of Construction: Powder-Coated Steel and High-Density Polyethylene . 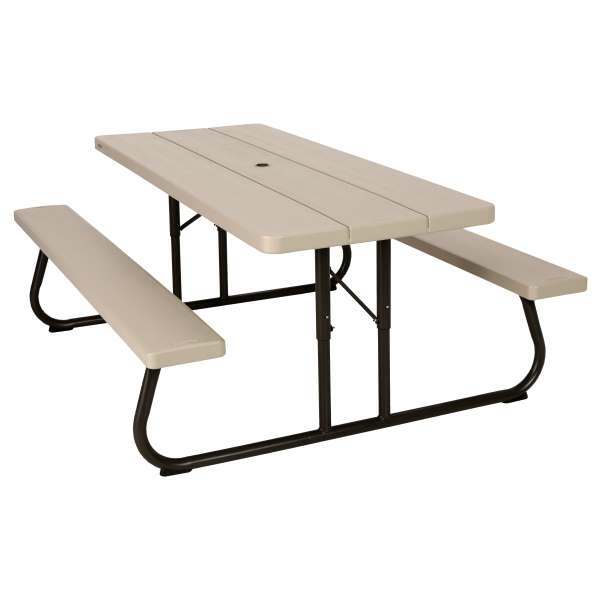 Picnic Table Weight Capacity: 500 lb. (226,8 kg). Table Top Material: High-Density Polyethylene (HDPE). Table Top Thickness: 2.1 in. (55 mm). 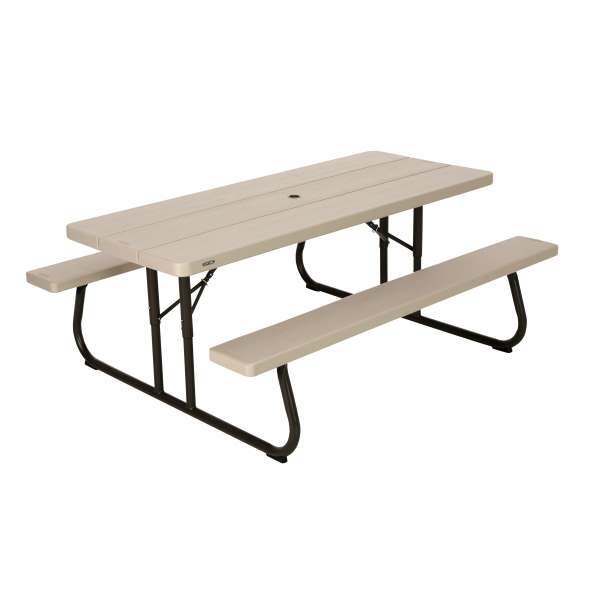 Q: Is the folding picnic table height adjustable? 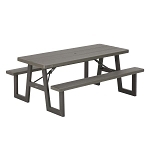 A: This picnic table does not adjust, but it does collapse to fold up flat when stored. 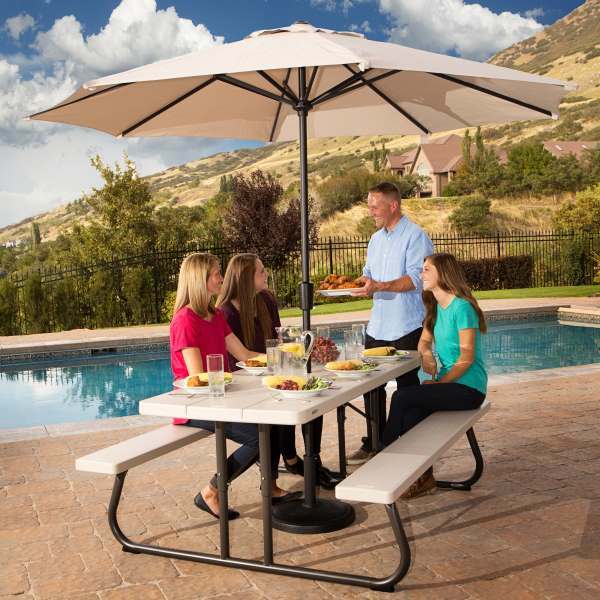 Fast Shipping: Orders for the 60173 Lifetime Picnic Table with Umbrella Hole generally leave the warehouse the next business day. Dimensions: 72.75" x 30.24" x 4.6"